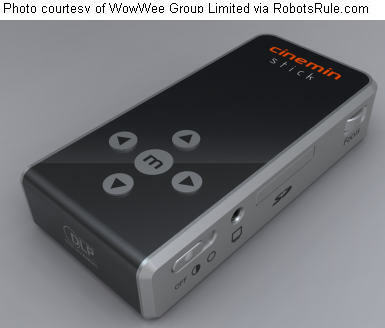 [12-01-2009] United Kingdom/Europe - Red5 has the Cinemin Swivel now! Click here now. [12-01-2009] USA - The Cinemin Swivel is available for order at Amazon with free shipping! Click here now. 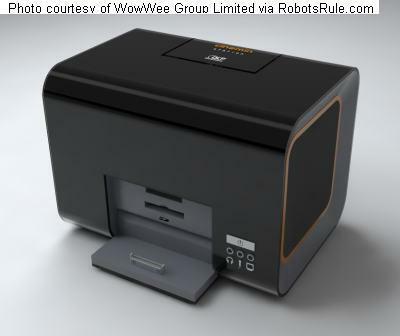 Get the latest robot and gadget news & tips as they become available. Subscribe now using this form. The future is here! 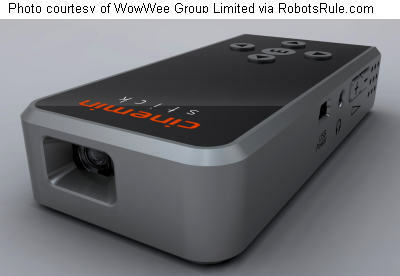 A tiny incredibly portable full featured video project that fits in the palm of your hand! 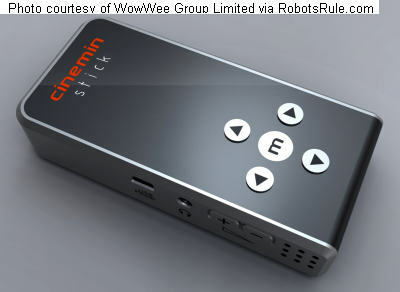 The Cinemin family of micro projectors use advanced technology from Text Instruments DLP technology. DLP gives the Cinemin projects a crisp clean picture quality that is hard to believe in a device so small. This is the same technology you will find in high end classroom projects, expensive high definitioin televisions, the projectors you enjoy when watching movies in a movie theater. 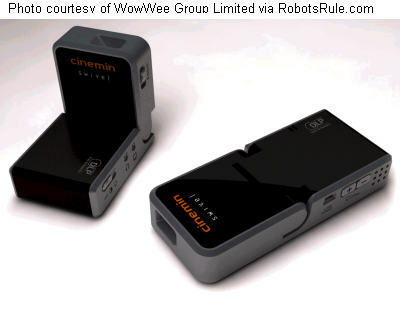 The Cinemin micro projectors are designed to unleash the video playing power of popular handheld devices like Apple�s iPod and iPhone, or any other device that outputs Composite video (Note: the high end Station model can accept video output from a computer). Now every surface can become a canvas for instantly viewing quality video; from corporate office walls to the inside of a camping tent or any flat surface that is available. 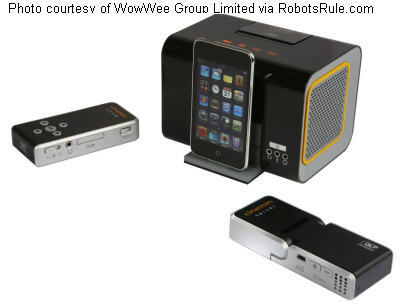 There are 3 different models of Cinemin projector: Swivel, Stick, and Station. Each model has different features listed below. Affordable lightweight pico projector. It�s about the size of a pack of cigarettes and will last about 3 hours when displaying video using its internal battery. Comes complete with a volume control and an adjustable hinge that can swing up to 90 degrees to facilitate projecting video on to the ceiling. Connects to a USB port for charging. Maximum video resolution: 420 x 280 pixels. 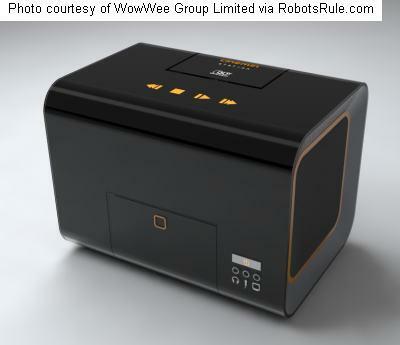 Compact micro projector that, unlike the Swivel, has its own internal memory for storing video which can be expanded using SD memory cards. Store you favorite video clips, animations, webcam snapshots, and more for later viewing. Can play back MP3 files too using either it�s monoaural speaker or through headphones connected to its 3.5 mm jack. Connects to a USB port for charging and for transferring data files to its internal 4 GB memory. The high end of the Cinemin family this micro projector is about the size of a small alarm clock. It has a docking station for Apple iPod�s and has the best audio of the three projectors for big stereo sound using its built-in speakers while viewing your videos and pictures. It can also act as an alarm clock. Can accept video from a computer, the Swivel and Stick can not (only Composite video input). Maximum video resolution: 800 x 480 pixels. [09-02-2009] The Cinemin Swivel is available for pre-order at Amazon with free shipping! Amazon has the Cinemin Swivel available for pre-order with free shipping. Click here to place your order now to make sure you get one of the first units before the pre-orders get sold out!